Huey Lewis could consider himself in "The News" on day one of the AT&T Pebble Beach Pro-Am after pulling off a superb hole-out from a bunker at his final hole. Lewis is a regular in the star-studded celebrity event and even had six-time major champion Sir Nick Faldo as his caddie a few years ago, and he enjoyed a spectacular finish to his first round on the Pebble Beach Golf Links on Thursday. 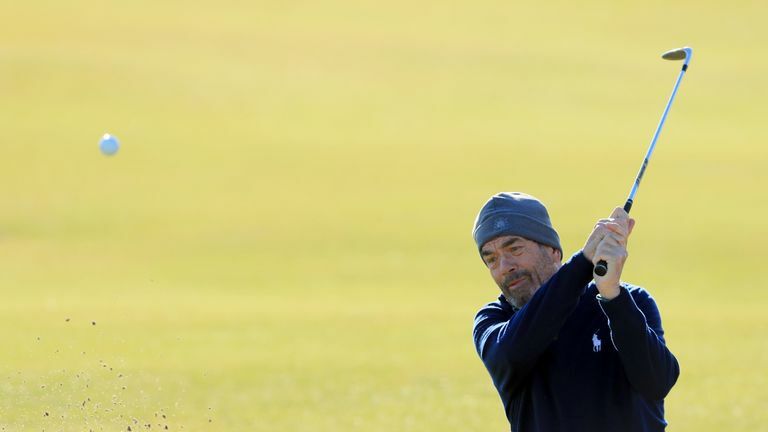 The 68-year-old pushed his approach into a greenside bunker and faced a tough task to get up-and-down as he had little green to work with, and what there was sloped away from him. But his sublime splash-out pitched in the rough and had just enough momentum to reach the putting surface, and he prompted huge cheers from the galleries when his ball rolled slowly into the cup. Lewis' good friend Faldo then ran through a number of famous hits, but could he get through the entire discography of Huey Lewis and The News?